BugBlog: Small white or small ultraviolet butterfly? Small white or small ultraviolet butterfly? Graced with a few black spots and a shade of yellow in their underwings, the plain wings of white butterflies contrast with the colourful and rich patterns of other butterflies. Unfortunately, this is a reflection of the limitations of our visual system. 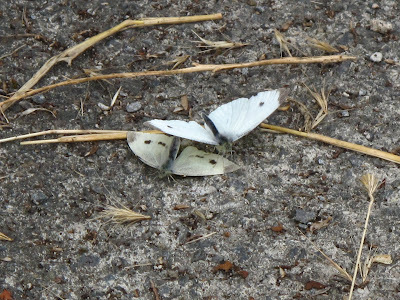 Male and female Small White butterflies, Pieris rapae, have different upper wing colours, especially in the ultraviolet (UV) spectrum: males absorb UV strongly but reflect most visible light, so they look a brighter white than females to us, but have a dark tone in the UV spectrum, which we cannot see. Wing colour patterns in pierid butterflies, the family of the Small White, depend on beads made up of pigments called pterins, which are deposited on wing scales, and in the Small White are UV-absorbing. 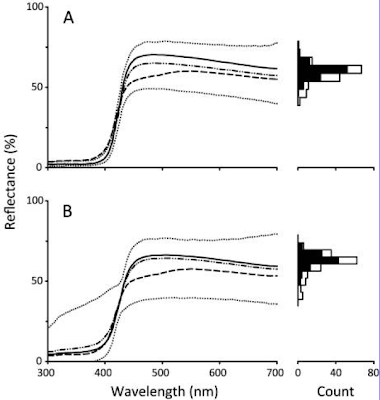 Males vary widely in their brightness and UV reflectance. Males able to produce more beads have darker UV patterns and appear brighter to our eyes. The amount of pterins a male can produce depend of the diet they had as caterpillars. Pterins need a lot of nitrogen to produce - they are the most nitrogen-rich pigment in animals - and the caterpillars can be nitrogen limited, so a brighter male is an indication of a good caterpillar diet. 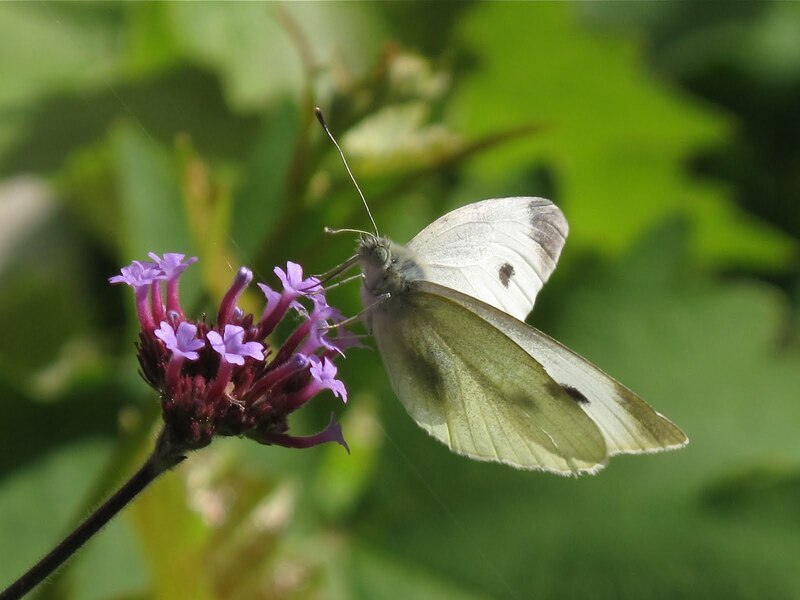 A brighter male also is also expected to be more desirable to a female, as during mating, male white butterflies transfer nutrients to the females in the form of infertile sperm, a nuptial gift which will increase the females life expectancy and therefore will be able to lay more eggs. A male with a higher quality diet can afford to be brighter and to produce bigger and more nutritious nuptial gifts. 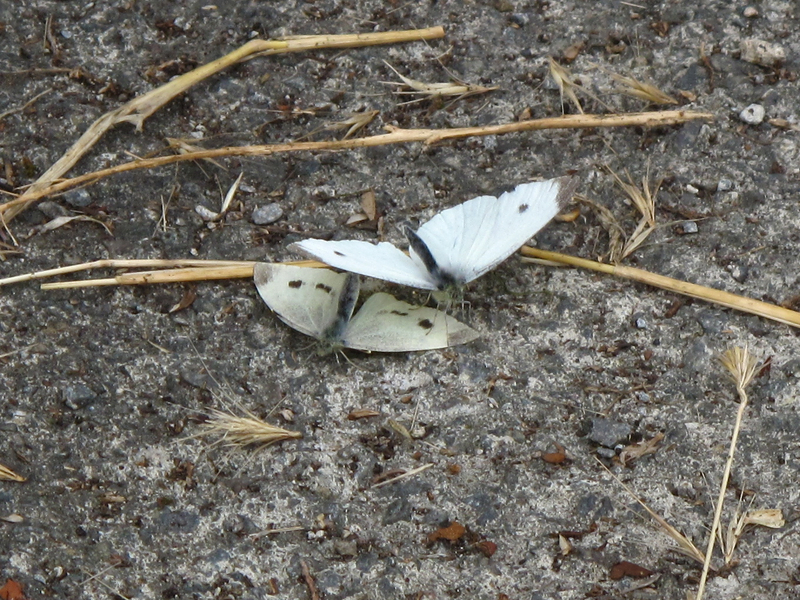 Courting Small White butterflies. The female, underneath the male is rejecting him by lifting her abdomen and lowering her wings. Their experimental results (below) together with further modeling of the female's visual system indicated that females, as expected, prefer to mate with brighter males. Sexual selection therefore favours brigher males. 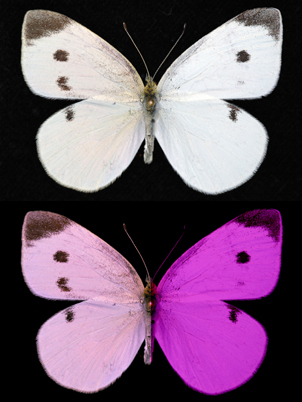 Spectral reflectance of male and female Pieris rapae in study 1 (A) and study 2 (B). Average female phenotype (dashed lines), average mated male phenotype (solid lines), average unmated male phenotype (dashed and dotted lines), and minimum and maximum male values (dotted lines) are displayed. Histograms to the right are for all males, with the proportion of mated males (solid region) and unmated males (open region) indicated in each bin (from Morehouse & Rutowski 2010). However, not everything is rosy (or ultraviolet if you wish) for these males, as the same colour patterns that make males more attractive to females, make them more visible to their main predators, birds, which are also able to see in the UV range. This study shows how sexual selection and natural selection through predators can work in an opposite direction, and reminds us that beauty is in the eye of the beholder. Thank you for commenting. That's great to hear that the post has been useful and has had an impact on educating kids. Let me know how you get on.